Antonin Scalia: A 1981 letter in which he lists his commitments to the GOP. Federal judges are supposed to be nonpartisan when they serve on the bench—yet to get appointed, they must gain the favor of a president and his administration. That means aspiring judges often navigate a complicated path. 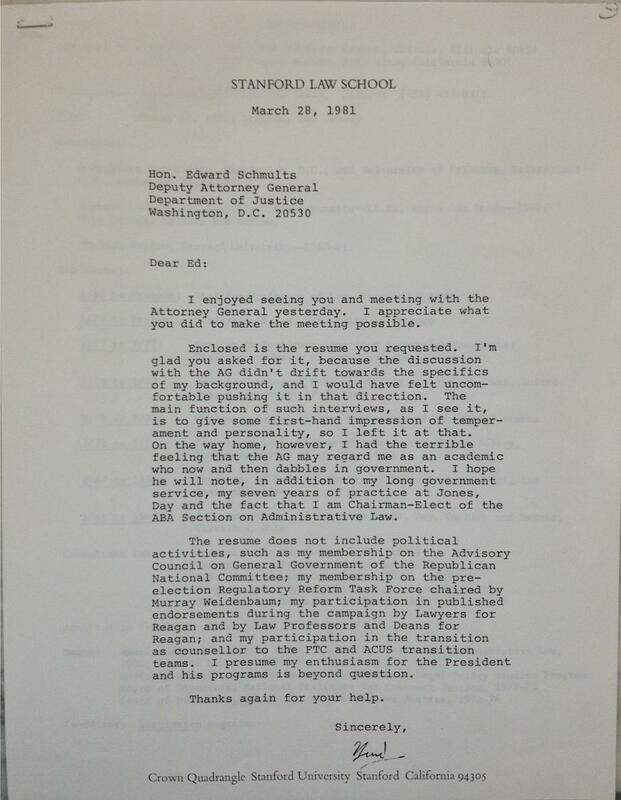 In this 1981 letter, current Supreme Court Justice Antonin Scalia writes to Deputy Attorney General Edward Schmults to highlight his political loyalties and his experience in government and legal practice. The day before writing the letter, Scalia met with Attorney General William French Smith to discuss possible positions in the Reagan administration. According to Scalia biographer Joan Biskupic, the future Supreme Court justice was “perpetually restless.” He had run the prestigious Office of Legal Counsel in the Ford administration before spending several years as an academic. (Scalia discussed his service in what he called the “wounded, enfeebled” Ford administration in his recent interview with New York magazine.) Now Scalia itched to get back into government, ideally as Reagan’s solicitor general. Scalia failed to get the solicitor general appointment—a bitter disappointment that, according to Biskupic, he “never forgot.” President Reagan made up for it, however, by appointing Scalia to the U.S. Court of Appeals for the District of Columbia the following year and to the Supreme Court in 1986. General Records of the Department of Justice, Office of the Attorney General, Subject Files of the Attorney General William French Smith, 1981-1984. National Archives.